From the edge of the world, the Isle of Skye Soap Company was founded. Its aim – to provide hand crafted aromatherapy soap, without colouring and using only the purest essential oils. All the natural pure distilled oils we use are plant based, as we believe this is better for your skin and our environment. 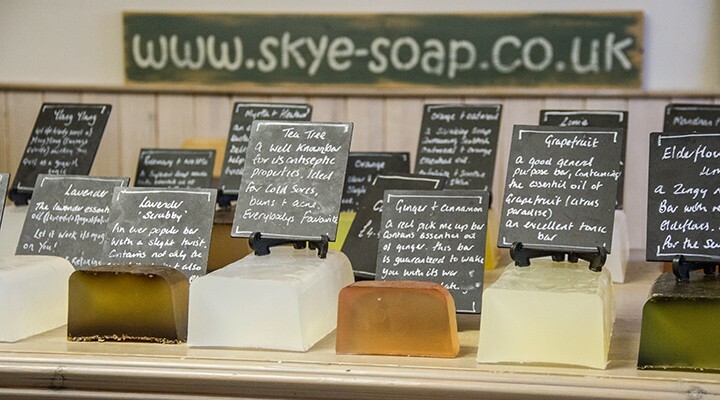 Skye Soap is a small family run business and has been trading here on the Isle of Skye since 2000. Skye Soap founder – Fiona is the chief soap maker and is a fully qualified aromatherapist. She lives with her husband Dougie who worked as a distiller in the most famous whisky distillery on Skye. Their two dogs Ruby and Noodles are frequent visitors to the Shop on the Square. Over the past Sixteen years we have built up a faithful following of online shoppers with our on-line store, attended several retail and trade fairs up and down the country as well as running our own busy little shop in Portree. We also hold an eclectic range of artisan goodies for the home – The Shabby Chic range – carefully sourced from Scotland, England and Europe. Our candles are locally made by the Isle of Skye Candle Company. Various magazines have featured us over the years including Country Living. We were also the proud winners of the Best Stand award at a Country Living show and the Scottish Gift of the Year Award. You can visit us during the year at the various Trade Shows we attend – including Top Drawer, Autumn Fair, and Scotland’s Trade Fair. Follow us online or pop into the shop. For any other information please contact.